We’ll be going over these tags, plus taking you through a detailed tutorial on how to implement a Custom Container tag. 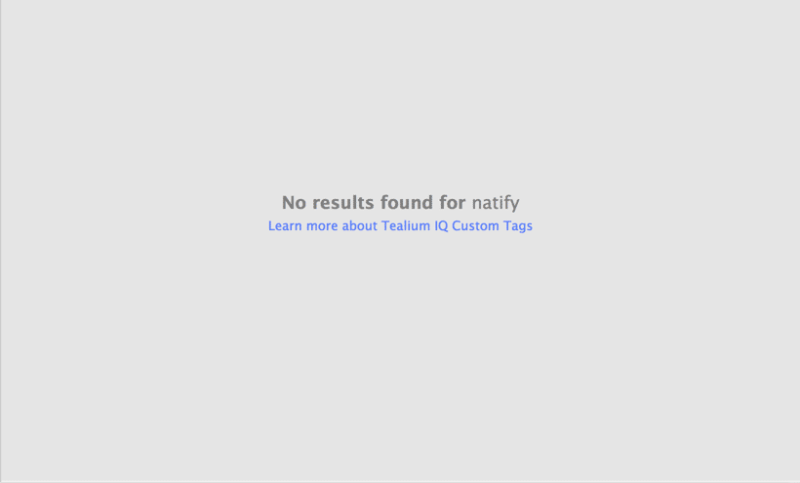 Tealium iQ is designed with simplicity in mind. Gone are the days where you have to rely on a developer to get a marketing tag out. 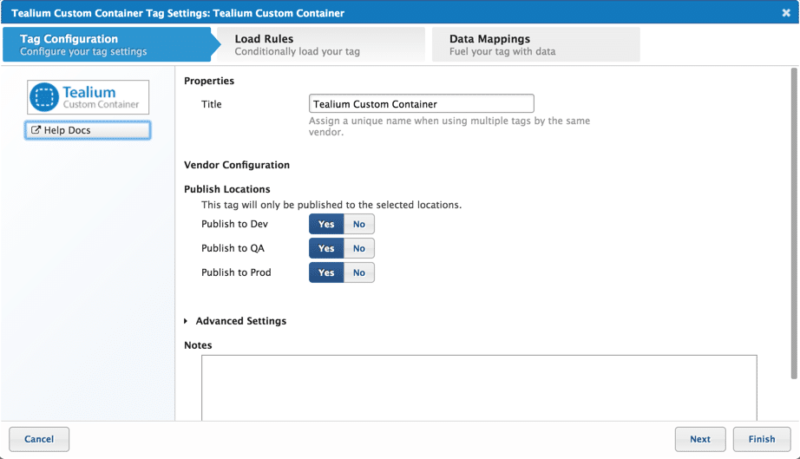 What makes tag management implementation through Tealium iQ so simple? 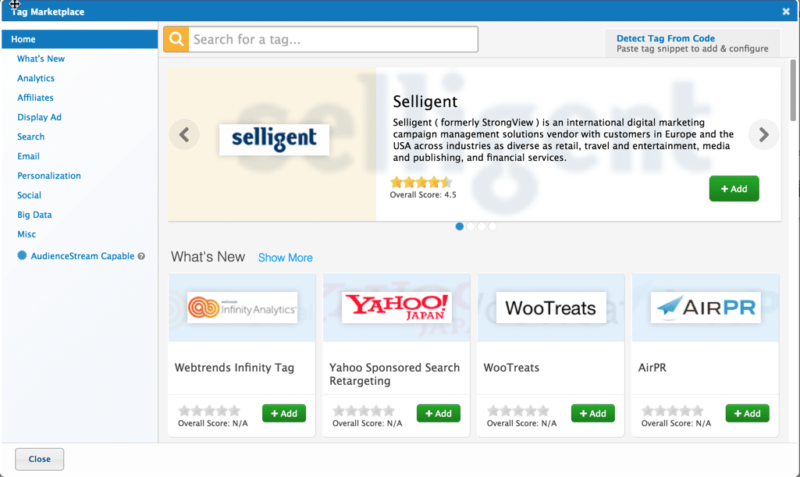 The tool has a Tag Marketplace that contains hundreds of tag templates. 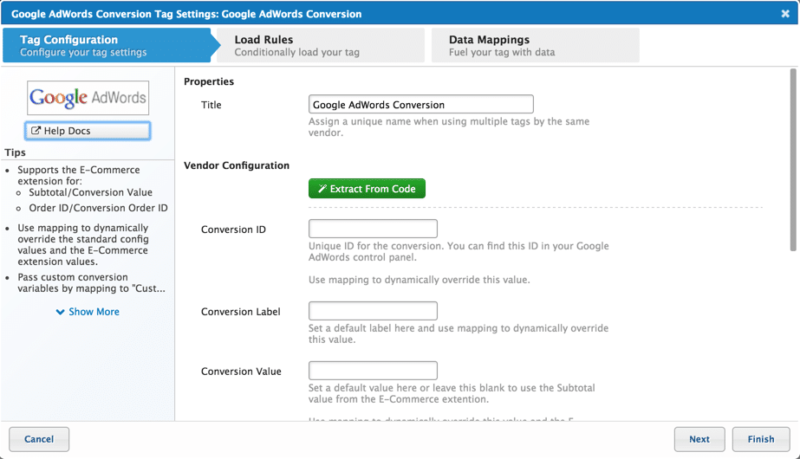 Each tag template contains form fields requesting information about the tag you want to implement, such as the account ID or conversion label. In many cases you can use the “Extract From Code” option that will pull the necessary information from a snippet of code that you copy and paste into Tealium. 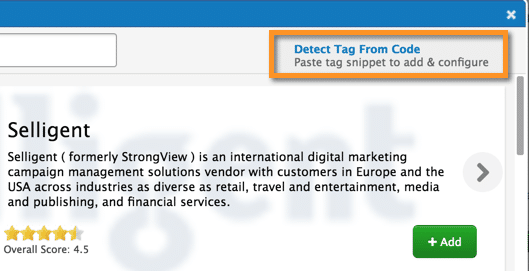 Within a few clicks and couple of copy-and-paste actions, you can have a tag ready to publish in no time. But what happens when you have a tag that needs to be implemented and you see this horrifying ‘ no results found’ image on your screen? There is no need to panic. 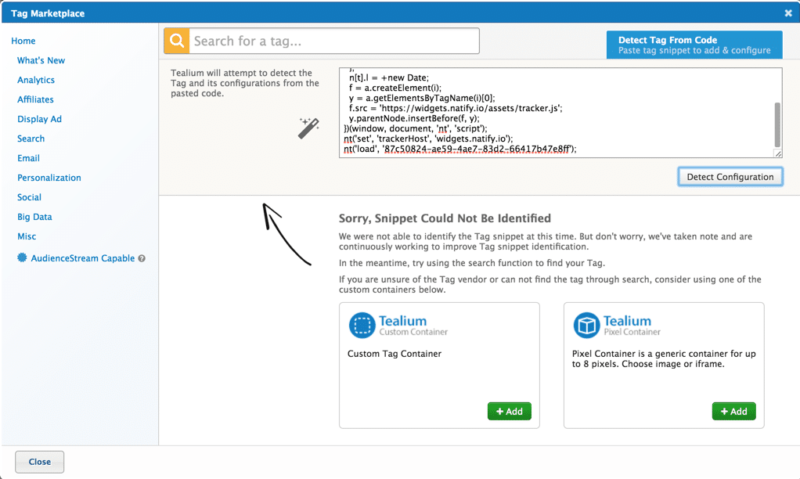 In these situations, you can take my code snippet and use the “Detect Tag From Code” tool found in the right hand corner of the Tealium Tag Marketplace modal. Once again, please do not panic. There is a beacon of hope in the form of the Tealium Custom Container and the Tealium Pixel Container. Let’s face the facts. You have a tag, but so far have been unable to implement. What’s a marketer to do? Tealium gives you a few options at this point. This template allows you to add up to 8 tags at a time that will be loaded onto the page as an image tag or an iframe. This template is the best solution if you have a static tag that doesn’t require any variable mapping, such as the tag below. 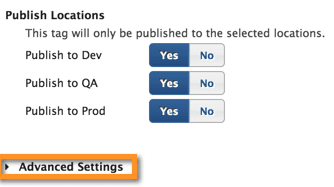 This option isn’t listed by Tealium when it fails to detect your code snippet, but is still a valid option. It’s very similar to the Tealium Pixel Container in that it allows you to add static image and iframe tags, as well as script tags. But this option adds the ability to use data mappings to dynamically set parameters to the src attribute of your tag. A Facebook tag is a good example of the type of tag that would need to be implemented via a Custom Container if it didn’t already have a pre-made Tealium template. When you first begin to add a Tealium Custom Container it might be a little off-putting. I mean, the only option you are given is to name your tag and where the tag should be published. What gives? The Tealium Custom Container requires something that other tags don’t require: coding. Before we get to that though, you should click the “Help Docs” link within the user interface (UI) and read the doc. Don’t worry, I’ll wait. I even put it right here so you don’t have to open Tealium (but you will have to log in once you click the link). Oh good, you finished. So what did we learn? You need to have permission to edit templates. You have to perform a “save” or “save as” in order to edit the template. But don’t publish yet; just save the version you’re working on. Do not add any HTML code. Do not include any <script> </script> tags in your code. 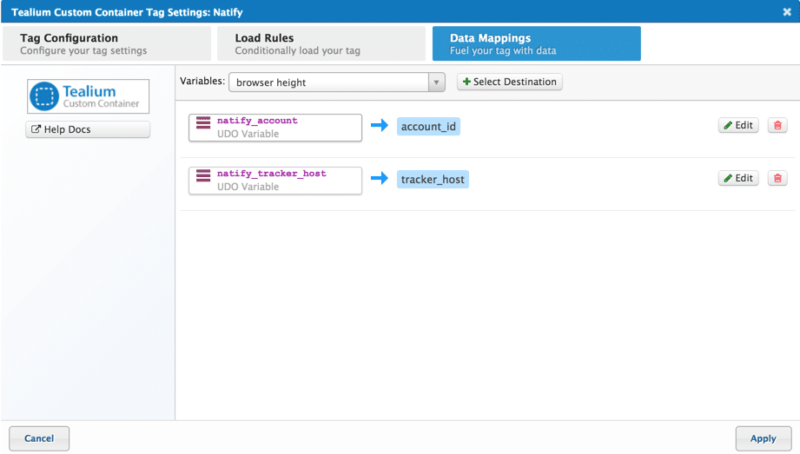 You can use data mappings to map Universal Data Object (UDO) variables to your tag. When saving, you should “Save Profile Template” instead of “Save Version Template” so that your template stays in place after you publish your current version. The reason you have to edit the template in order to use a Custom Container is because all tags in the marketplace have a template similar to what your Custom Container template will be once you are finished. The only difference is that you have to add all the code for a Custom Container, versus having the code already in place for you. I recommend copying the code from the window and pasting it into your favorite text editor. In your editor you should see what looks like — at first glance — very complex code. Everything else, you won’t need to touch. Let’s go over the steps that need to be taken for each section in order to implement the tag below. To set these up in the template, replace the example tag parameters with the values you would like to use. I recommend leaving the values of ‘tracker_host’ and ‘account_id’ as blank and give ‘base_url’ a default value of ‘//widgets.natify.io/assets/tracker.js’. You’ll need to take a couple of extra steps outside of the template in order to give value to ‘tracker_host’ and ‘account_id’. Please note that you will have to type in the destination variable to match the name you used within the template. // Insert your tag sending code here. If you were to save this template and publish this tag to your dev or QA environment, you would see that it is working without having to edit the Loader Callback Tag Sending code and the Loader Function Call sections. These sections are for a very specific use case. Then we would set up the Loader Function Call by uncommenting the necessary lines to have Tealium load the script tag, instead of the function in the Tag Sending Code section. Next we want to set up the Loader Callback Tag Sending Code section to fire our two Natify function calls. The Tealium Custom Container isn’t the only template you can edit; you can edit the template of any tag found in the Tag Marketplace! Now that you know the basic layout of a template, you can take a look into other tag templates and see what makes them tick. As you become more comfortable with template editing, a whole new level of tag management opens up that allows you to use Tealium to do your bidding. Let me know if you have any questions about the Tealium tag management examples provided, or any Tealium implementation questions for that matter. Thanks alot, very nicely exlpained. But had some troubles in the last part with the call back functions. how does tealium do this, and which file where we talking about ? I got that part about “wait for an event”, as do call back functions work, but in the Tealium template this doesnt appear easily! TJ is an Analytics Consultant at Blast Analytics & Marketing who specializes in Adobe Analytics and Google Analytics implementations. He has a strong understanding of various tag management systems, such as Adobe Launch, Adobe Dynamic Tag Manager, Google Tag Manager, Tealium iQ and Ensighten. TJ Webster has written 2 posts on the Web Analytics Blog.